Key Date Coins Lowers BP to 8%; Other Houses, Take Heed! Eddie Caven of Key Date Coins does everything right, from the best coin photography on the portal to superior numismatic descriptions, including varieties. He has just lowered buyers’ premium to 8%. He needs one more component to be the best coin auction on Proxibid. We don’t know if he will do that because only a few of our top-ranked houses do: and that is, 0% seller premiums. To begin with, take a look at the digital email advertisement used as a photo for this post. If there was a Proxibid badge for Internet advertising promotions, Key Date Coins and, perhaps, Weaver Signature Coin Auction, would deserve it. In one screen on desktop, laptop and, yes, smartphone, Eddie Caven describes the Nov. 27 auction in three lines, provides hotlinks to the auction as well as his home page, uses complementary colors, and provides email contact including access to join mailing lists, learn more about his house, and so much more. Journalism and advertising students at Iowa State University can learn much from this. And his photographs–amazing! There are houses in our top-ranked list to the right that never rise to the top because they just cannot master digital photography, something that irritates us to no end, because we can do it with a cheap cell phone. Key Date Coins also ships within a day, and updates shipping as on eBay. Several houses will drop in the rankings next week because of slow shipping. The only thing keeping Key Date Coins from being the best on Proxibid is the consignments. Eddie specializes in Carson City Morgans, but those are plentiful everywhere else. He needs to feature fewer common Franklins and rounds and more rare and gold coins. He needs to use his communication and numismatic skills to attract better and more diversified consignments. The top houses in our rankings have that variety, especially Western Auction, Leonard Auction, Capitol Coin Auction and SilverTowne. Others have good consignments, but allow too many self-slabbed or dipped coins into the mix, making buying on their sites hazardous. We have purchased much from each of our top-ranked houses, but only in a select few do raw coins actually grade reasonably well at PCGS. See this post as evidence. We have recommended in the past that auctioneers fire–yes, fire–consignors who continue to send them dipped, damaged or problem coins. We suspect these consignors are coin dealers. We know the dealer network intimately. See this post for more information. Every time we mention this, suspect coin dealers consigning to Proxibid houses send us emails noting that several of our top-ranked houses are owned by dealers. Yes, and for the most part, they follow ethics of the Professional Numismatists Guild. We hesitate to mention one house with low BP, excellent shipping, and good credentials, whose house dropped dramatically in the rankings for the past several months and may not rank at all next month, because its owner believes consignors are expert numismatists who never would send problem coins. Right. Another house, which we don’t mention, features an auctioneer who in the past was an officer in an organization representing many of the houses on Proxibid. He just doesn’t want to hear that his consignors are sending problem coins. As a result, he no longer is listed in our rankings. We stopped bidding in his auctions. In the 3+ years we have been buying on Proxibid, we began to notice trends. Some houses wonder why they fall or are unranked in our evaluations. The answers are simple: your consignors, poor photography, slow shipping. If Key Date Coins had the consignments of Western, Capitol Coin Auction and Leonard Auctions, his house would emerge as the preferred coin buying place on the portal. It’s not only about the buyer’s premium. We would rather bid in an auction with high premiums and honest-to-goodness gradable coins than in one with zero percent that sells inferior products or doesn’t note flaws or problems. We just lost another $1000 in one of our favorite houses because the auctioneer did not mention problems with dipping. The pictures seemed to indicate dipping in this case, but we decided to trust the auctioneer. This is the second time in a month this has happened to us, setting back our scholarship fund at least six months. Recommendations for Key Date Coins and other houses looking to enhance consignments? Do not accept “junk” consignments with a few choice lots as cherries on dung piles. Advertise regionally to secure consignments from estates or travel to estate auctions and make purchases yourself. We hope this post informs current houses and helps Key Date and others secure the consignments that attract competitive bidding. To view two recent auctions that did just that, take a look at Fox Valley Coins and a newcomer who made a big splash this weekend, Braxton Auctioneering. Seldom do we see a newbie online house like Braxton do everything right–well, almost everything (as we have yet to evaluate shipping). 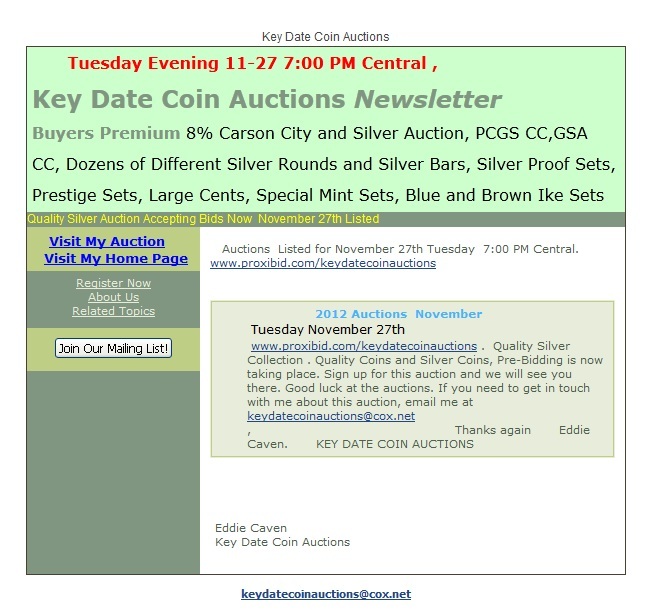 This entry was posted in Articles, Best Practices, Featured Updates, Find the Flaw, Grading Auctions, News and tagged American Numismatic Association, Auctioneers, AuctionZip, Best Practices, Braxton Auctioneering, Capitol Coin Auction, Coin Auction, Eddie Caven, Fox Valley Coins, iCollector, Key Date Coins, Leonard Auction, National Auctioneer Association, PCGS, Proxibid, Proxiblog, Silvertowne Auction, Weaver Signature Coin Auction, Western Auction. Bookmark the permalink. 2 1/2 %. That leaves you with a whopping 1/2 % of the 8% for advertising etc. have to own the material. We would like to own it all but our bankroll won’t cover that. Sorry but if we are to work for free I think i’ll find another line of work. First of all, Dave, you get plenty of good consignments. That is not the case for everyone. Second, this is about Key Date Coins getting ever better consignments, and there are a few ways to do that. Third, there are recommendations to secure choice consignments in this post. Any company would increase the bottom line by following them. 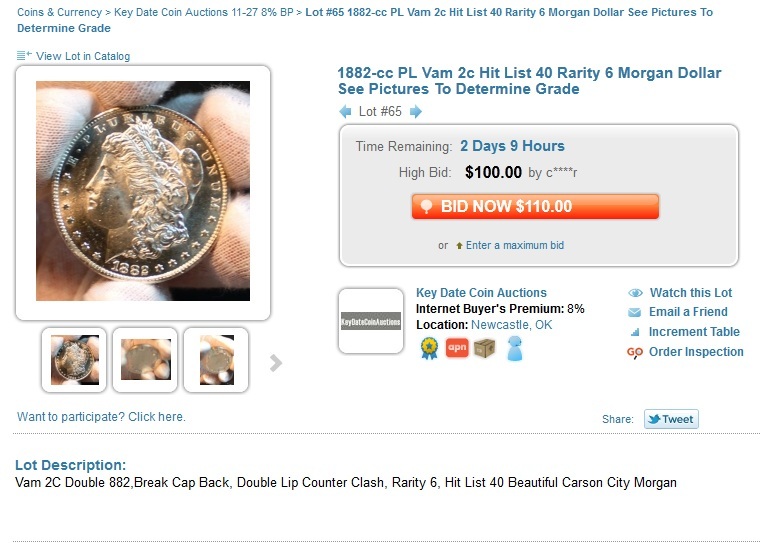 My advice has been consistent: Any house that schedules regular coin auctions–that doesn’t rely on estate representation as a typical auction company does–should secure their own consignments by advertising to buy rare coins, bullion, etc., and by traveling to estate auctions and securing coins themselves. Otherwise, the coin dealers selling on Proxibid–ones that charge zero percent, either for seller or buyer–will continue to beat your bottom line because they advertise for coins, have walk-ins for coins, and buy coins themselves at estate auctions onsite. And the dealers that do not sell on Proxibid or dealer networks will continue to consign to auction companies–good, bad and ugly coins–because, well, you’re dependent on them. My advice to any company that sells coins regularly on Proxibid is to stop complaining about their fees or APN–its the name of the game in the coin trade, like it or not, because more coins are purchased now online than anywhere else–and to decide whether to know numismatics so they can fire bad consignors and to secure their own consignments because that is where the profit lies. That’s solid advice. Like anything else, consignors of choice coins are going to go to the companies that offer the best deals. Without naming them, several companies on Proxibid charge 0% for consignments–some to keep good consignors, some to get highest grade coins.